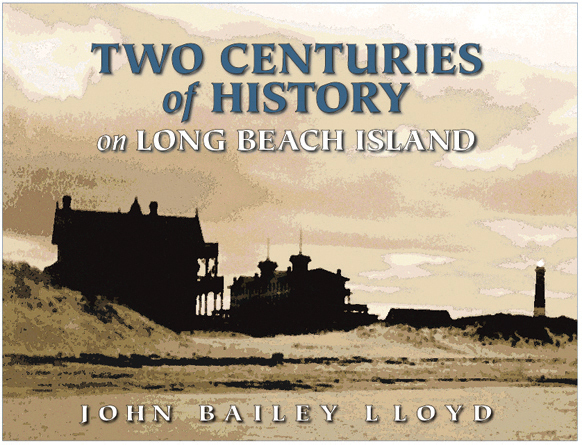 11 1/2" x 8 3/4"
This, the third and final book in the late John Bailey Lloyd’s Long Beach Island pictorial history series, is the long-awaited companion book to Six Miles at Sea and Eighteen Miles of History. The Island’s beloved historian left us a legacy of stories and information about these shores, and in Two Centuries we discover more fascinating history about Island names, architecture, shipwrecks, storms, and the mainland. Just a few of the chapters include; the Lucy Evelyn at Christmas, Township Lifeguarding, Fishing, Barnegat City - Fever at the Oceanic; the Signal House, San Souci, Beach Haven Cottages - Parry House and Coral Street, Curlew Cottage, the Shakespeare Cottages, Onion Domes; Beach Haven Merchants - the Engleside Baby Dairy; Purkey's Pond, Tucker's Light, the Tuckerton Wireless, Pinelands Plains, Cear Bogs and the story of the "Hawkin Bear. "Every time people pass the shack on the Causeway, they wonder who owns it, who built it, what was it for. John Bailey Lloyd knew. Whenever people go to the north end of the Island, they wonder how Old Barney got its name. John Bailey Lloyd knew. And what was the Mansion of Health all about, and was there really a swamp where Surf City now sits, and when was beer ten cents a glass? John Bailey Lloyd knew, and in two marvelously entertaining books, told us. Six Miles at Sea: A Pictorial History of Long Beach Island and Eighteen Miles of History have been perennial best sellers here, but each time Lloyd finished one, he found out more stuff and discovered more pictures and heard more stories. He put some of these into an occasional newspaper column and was finishing work on a third volume when he died two years ago. And now his publisher, Down The Shore, has brought out Two Centuries of History on Long Beach Island, which expands our knowledge and appreciation and enjoyment of "this blessed isle" and makes us miss Lloyd all the more..."
John Bailey Lloyd was born in Johnstown, PA., and had been on Long Beach Island since 1942, when he was ten years old  in time to see old landmarks like the boardwalk, the Engleside Hotel and the vast emptiness of the Island as it once was. With time out for service in the Coast Guard, graduate school and some travel, he has spent nearly every summer here. In 1977 he and his wife, Jeanette, and their two sons became permanent residents and moved into the family's Victorian summer home in Beach Haven. A graduate of Mount St. Mary's College in Emmitsburg, Maryland, Mr. Lloyd had a master's degree in English from the University of Michigan and a master's in library science from Rutgers University. He worked in the reference department at the Ocean County Library in Toms River, and the Bishop Historical Library there. Copyright © 2005 Down The Shore Publishing Corp. The words "Down The Shore" and logo are a registered U.S. Trademark.